It is now hard to comprehend how badly epidemics hit the population of the UK in the days before the advent of decent housing, clean water, modern sewerage systems and antibiotics. For example measles and whooping cough alone accounted for 50,000 deaths in England and Wales between 1838 and 1840. The first smallpox hospital was set up by a charity during 1746 in a house in Windmill Street just off Tottenham Court Road. The house was soon full and a couple of other houses were acquired (Coldbath Fields and Old Street). By 1769 these homes were amalgamated into a new smallpox hospital at Battle Bridge (Kings Cross). Although rebuilt in 1846 this was the only smallpox hospital for the whole of London till the 1870s. The South Western Fever Hospital in Stockwell was opened on 21 January 1871. It was built for the recently formed Metropolitan Asylums Board to the designs of architect Thomas Henry Wyatt. Housing about 100 smallpox and 200 fever patients in several separate buildings, the hospital was located on a seven and a half acre site on Bedford Private Road between Landor and Pulross Roads. The land cost £15,075 and the money was raised by a levy on all the parishes and poor law unions across London (probably at the rate of one-eighth of a penny in the pound). 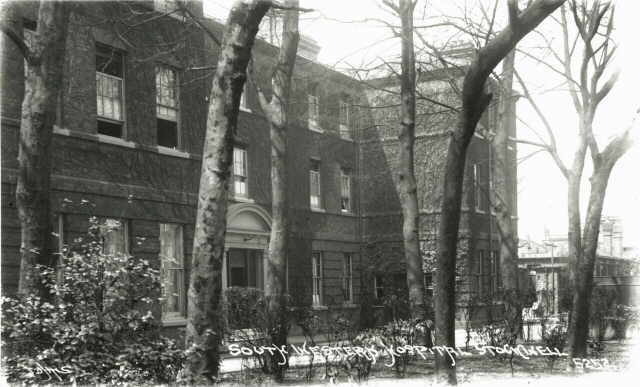 Despite considerable local opposition to siting a smallpox/fever hospital in the area, the hospital was built and was the second poor law fever hospital built in London. These fever hospitals formed the first centrally planned hospital service for the capital. The large purpose-built isolation block suffered extensive bomb damage during World War II. Most of the buildings were demolished when the hospital was modernised in the early 1990s, and reopened as the Lambeth and Maudsley NHSTrust.